Pure Happiness from 4:00am. I wake up with an exhilarating feeling of complete happiness filling every cell of my body. The kind of positive, everything-is-wonderful-and-possible feeling you just want to savour and store for potentially tough or bland times. We have just spent a wonderful weekend in a wonderful place – the kind of weekend that just felt like one big, warm, adrenaline-inducing hug given to you by a loving and alluring being. Ahh. Dozing off again, sort of, I wait with jumping out of bed till 6am, when the sun rises and we hurry down to Tallow Beach together to roll out our yoga mats facing the orange lamp sending its burning red glory down on the calm ocean. What a spectacle! At 7am, we’re seated on the verandah of the charming Suffolk Bakery (which opens at 5:30am to serve the early surfers, haha! ), smoothie bowls and coffees in front of us, fuelling up for a work day in Sydney. Surry Hills & Friends. Our Airbnb studio is a converted garage in a small, quaint lane off Crown Street. It’s clean and neat and does the trick – makes us feel like we’re living in Sydney. On all of our previous trips, we’ve stayed in Bondi, but this time we opted for a central solution. I still love and probably prefer the beach area, the fact that you can hop right down on the coastal walk when waking up, but there are also advantages to waking up in Surry Hills. It’s closer to our offices, it’s where one of my best friends lives, it’s a very beautiful area too. It makes it possible for me to meet my friend for a quick lunch, both of us super thrilled that this is even possible, that we are right here, together, and in the afternoon, I actually decide to work from Surry Hills Library – it’s such a great place for getting things done while at the same time watching various types of people pass by on the street in front of the panorama window and really feel that you’re in Sydney. When the library closes at 6pm, my friend picks me up, and Sanoop joins us for a drink at The Clock, after which we all go and meet my friend’s boyfriend, who is from Sydney, for a delightful dinner and even more delightful conversation at the same Thai spot we all met up at one bright summer nights a few months ago, Muum Maam. Walking home through the neighbourhood late in the evening, Sanoop and I stop at Maloneys Grocer (one of a tonne of gourmet groceries on Crown Street!) to pick up a cup of heavenly coconut milk-based strawberry ice-cream. Yum. Centennial Park & Cafe Life. Morning run to the park around the corner from our dwellings, Centennial Park, a large haven brimming with manicured lawns, purposefully rugged meadows, colourful birds, rose beds and clusters of Australian figs, evergreen oaks, exotic pines, eucalypts, paperbarks and other magnificent trees and shrubs, girlfriends riding horses side by side while chatting, large bicycle groups, runners, ponds and lakes. Ahh. What an energy boost! Back home, we have brekkie at the small table by the one window in our studio, overlooking a small charming community park – coconut yoghurt with muesli and fresh raspberries. Pukka tea. Walk up Crown Street together. Sanoop gets a cup of chai made on a house-developed concoction from Cafe Mint. I get an Allpress soy flat white from Calipress. He takes an uber to the office. I decide to not go to my office and instead work from a quiet, comfy corner of a cosy cafe, Pieno, with excellent wifi and overlooking Crown Street and a small garden. Here, like at the library, I can concentrate on work while simultaneously feeling that I’m immersed in the middle of Sydney life… watch people, overhear snippets of conversations, order heavenly coffee. Barre Body. At noon, I walk through leafy, vibrant Surry Hills to get to one of my favourite barre studios for a flowy, fun, challenging class, which makes me feel strong, check, and flexible, check, haha. Nearing as well as leaving the studio, I pass soooo many cool, creative types out and about for cool, creative lunch meetings. My own lunch I pick out from the booming salad counters at About Life, and as dusins of people are sitting around the whole foods store with their eyes and fingers glued to their laptops, I decide to join them and work from a narrow wooden bar between a fresh juice stall and the natural cosmetics section all afternoon. Again, I feel very immersed in Sydney life – whilst being super productive due to all of its fresh, energetic stimulants. Ballet at Sydney Opera House. At around 6pm, I wander up Crown, turn left onto Oxford, from where I head up through Hyde Park – sprinkled with local skaters, camera-loaded tourists and suit-clad folks – to meet my friend in the CBD, from where we hail a taxi to take us down to the Opera House. After having been huddling around in Surry Hills, it feels fantastic to be dropped off in the midst of an iconic scenic view… the Harbour Bridge, electric lights reflected in the softly rolling waves, the scores of tourists creating instagram stories similar to the ones my friend and I record while standing arm in arm with our hair blowing into our glowing eyes and giant smiles. And then there’s the wavy architectural pearl on our right side, which makes every Dane warm and fuzzy with pride. Yesterday was even Jørn Utzons 100th birthday! We celebrate that – and life in general – by eating delicious antipasti and drinking even more delicious rose wine at the outdoor restaurant just outside the icon before going inside to experience the Australian Ballet perform an intoxicating display of strong modern choreography and costumes and phenomenal classic elegance and musicality. Such energy, such humour, such creativity! Ahh. Walking My Friend to Work. We share a cab home, and the next morning, I pick her up from her flat – which really looks like a home now; they’d just moved into when we were here last – and walk her to work. With coffee from Brewtown Coffee Roasters on Crown Street. Just like the good old days when we both lived in East London and worked together. Exponentially even better, actually. We were happy and content then; we are happy and content now. I don’t doubt we’d still be happy if we were still wandering around in London sipping Kiwi coffee, but being here in Sydney now represents more than just a chance of scenery – we’ve both developed a lot; allowing ourselves to keep having our eyes and minds wide open has just naturally led us both to move on, geographically and on so many other levels as well. Neither of us is restless or controlled by compulsions to achieve anything in particular; we are both curious about ourselves and the world around us, we both love our boyfriends and feel at home where they are, and it feels satisfying to act accordingly. And good to talk about it with each other. Roughly, we still talk about the same things: what is home, love, family bonds and communication (challenges), how do we best contribute to the world, love, what do we define ourselves as, love, how do we stop thinking so much about definitions and just go with the flow, love, what are we good at, love, how we we meet and connect with people, love, cultural similarities and differences, love, nostalgia, love, how best to stop being nostalgic and instead focus on the present… But our sense of awareness and confidence has grown, I think? Haha. Nomad. Date night at one of our new favourite restaurants. We sit at a large wooden bar in the middle of the room, with a front row view of the carefully orchestrated act performed by the cheerful and talented people taking care of our wining and dining experience. Amazing food (local, seasonal, natural, full of flavour and all that jazz), amazing wine, amazing service, great lighting… we’ll be back! Maybe! Or maybe not – but we’ll definitely think of it fondly and recommend it to friends. A Day in Melbourne. When se step out from the airport just after midnight, we immediately feel a slight crispness in the Victorian air. We spend the first night in a sleek downtown hotel, lending us a sweeping view of the shiny skyscrapers and intricate traffic: this is Melbourne too; normally, we stay in slightly more rustic and tranquil areas bordering the CBD. Fun to get this perspective too. After a brief, deep sleep, we head down to League of Honest Coffee for coffee and sourdough with Vegemite before checking into our cool Collingwood Airbnb loft – clearly owned by a family with kids who are encouraged to explore their arts & crafts skills at home, which is always nice to see, just as it’s to generally imagine what these people, who live in this colourful space is like… it’s messy and overstuffed, but cosy, and the kitchen is full of expensive equipment and wine, and there’s thankyou soap in the bathroom, and the balcony is home to a giant barbecue grill and overlooks the city’s skyline… While I love to stay in places that are so beautiful and harmonious that I don’t want to change a thing, it is also inspiring to stay in places where your mind starts working: if I could, how would I decorate this place; which elements would I exchange, and with what, and which would I keep? We both work from there in the morning hours. Then walk up leafy, vibey, street art-filled Gertrude Street in warm sunshine for some beautiful bowls of vegan ramen and matcha lattes, at very trendy Neko Neko, served by a girl with rainbow-dyed hair. In the afternoon, while Sanoop is off to some meetings, I work from an old favourite of mine, STREAT, where the wifi and coffee are impeccable, the outdoor area so lush and green, the service so kind – they let me stay and type away on my laptop long after closing. When I finally finish, I chat with my mum while walking up Gertrude and down along Carlton Gardens to get to Barre Body in Flinders Lane, another one of my absolute favourite studios, for a barre & yin class. Candles, blissful music, very balletic. The yin elements are integrated into the barre routine – we get into different classic barre positions, e.g. one shin resting on the barre and the other leg just slightly bent under the barre and both arms moving softly across the barre to reach the pointed foot soaring above the barre, and stay there for a few minutes; or, at least, for what feels like a few minutes. The teacher doesn’t count up or down, doesn’t mention for how long we’re supposed to hold the poses. She just walks around slowly and gently promises us that it’s not about how far our arms and legs can go, not about how quick or flexible we are, not about comparing ourselves with others or how we did yesterday: all we have to do is tune into ourselves (after years of working from all kinds of public co-working spaces, I’ve become good at tuning into something, but it’s always good to keep practicing – especially when what you tune into is just that, your own mind and body, and not external factors), stretch our spines, be graceful, feel graceful. In savasana, by the end of class, I put my hands on my belly and breathe all the way down into it, again and again, focussing my thoughts on the natural rise and fall of my resting hands. 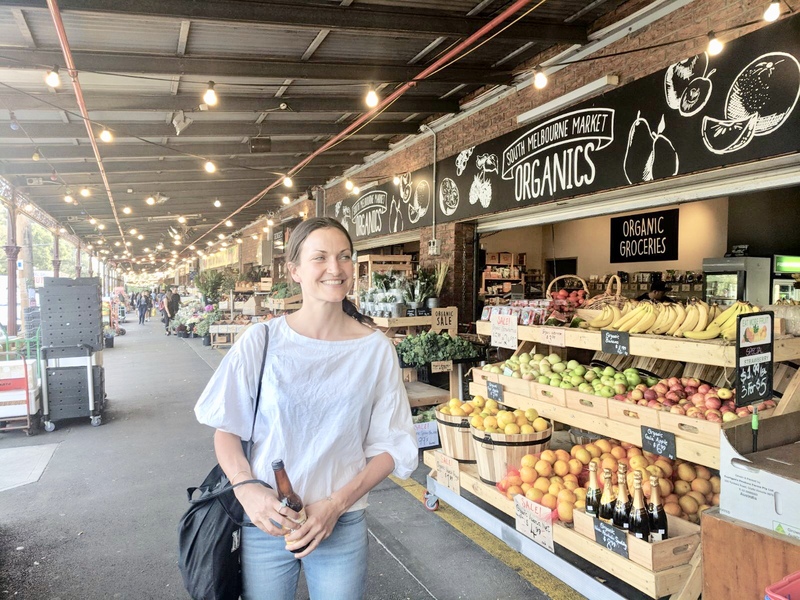 Such a beautiful autumn evening – coming down into one of the liveliest streets of Melbourne after the wonderful class, the freshness of the air makes me feel so excited – or maybe it’s the fact that I’m meeting Sanoop for dinner at fancy Indian Tonka. Another Day in Melbourne. We both wake up at sunrise, 6:45, and stroll through quaint Abbotsford before we start jogging slowly along the Yarra, the light yellow morning light flickering through the trees lining the river. We pass cute animals at the Children’s Farm and several other joggers as well as bicyclists. We’re like kids, dogs, puppies, excited about the light, the smells, the fresh air. Haha. Lavish brekkie at The Kitchen at Weyland. Home, get ready, cycle up Gertrude, find a seat at State Library of Victoria, the final, most regal and quietest, work space of the week. In the late afternoon, I meet an old colleague from London for a wander and peek into the NGV. She and her husband are English – after their recent marriage, they went on a honeymoon to New Zealand, and now, on what was intended as the way back to London, they’ve decided to make Melbourne their home. We talk about the excitement of that, their job and house hunt, etc, and only near the very end of our date do we exchange memories about the good old days and stories of when we most recently caught up with mutual acquaintances… I like that that wasn’t the driving force of the conversation. It is really nice to hang out with her! From the gallery, I cycle over to South Melbourne Market and wrap up work from a cafe, where Sanoop picks me up in the evening. We stroll around the wonderful market, buy kombucha and dried sour cherries and pears, and then walk all the way via the vibrant South Bank in the stunning sunset and Flinders Lane to Collingwood, where we meet a couple of friends for a fun night out – drinks at the pub Le Bon Ton followed by modern Australian fare at the elegant Saint Crispin. Christmas Brekkie. My Christmas present to Sanoop (and myself🤣) last year was a gift certificate towards a monthly breakfast throughout 2018, in a place we’ve never been to before, possibly in a new town/country every time. In January, we went to Shuk Bondi in Sydney; in February, a small coffee shop in Venice. In March, Alchemy in Ubud. Now, Victoria Market in Melbourne. Vegan wraps, kombucha smoothies, enjoyed whilst browsing around the stately, buzzing market brimming with local goodies of all sorts. It’s a super chilly, windy morning, so before picking up our rental car for the weekend’s roadtrip, we pick out two oversized, super soft hoodies, made in Australia, with embroidered koalas on the chest. Yes! And we pick up a coffee at Allpress before checking out – the roastery is just opposite our flat, so it would be weird not to. As such, we’re ready to hit the road leading to a large national park 2.5 hours south of the city. A beautiful drive into rural Victoria – as well as into heavy, heavy rain showers! Fish Creek is the last town on the road leading to our Airbnb for the weekend, a cabin right by the gate to the national park. As such, we stop here for a scrumptious lunch at this magnificent Art Deco pearl of a hotel and pub and a stroll around the idyllic hamlet to check out its small galleries, cute bookstore and well-assorted general store. Lovely local vibe all over the place. When we finally get to our cabin, which is clean, pretty and cosy and overlooks the ocean and Prom, we decide to stay in for the rest of the day. It’s still raining – and it’s getting dark. We light candles, curl up in blankets and pillows, read magazines – and eat a dinner of dehydrated beetroot crackers, hummus and Tasmanian carrots from the store in Fish Creek before falling asleep at 9pm. Wilsons Promontory. Starting this trip on mainland Australia’s most easterly point, in Byron Bay, we’re now wrapping it up in a nature reserve that covers the southernmost tip of it. The Prom is known for its lush flora, rugged granite mountains and abundant wildlife, including kangaroos and wombats. A nature reserve that invites you to turn off your phone, breathe in the air, and start hiking. Sunday morning, after a short run and some yoga, we drive into it. It’s drizzling slightly all day, and it’s still very windy, and we would like to come back sometime when the sky is clearer, BUT this is good too. Driving for the most part, we stop here and there to walk through the wild grass and across the expansive beaches. The good thing about the what some locals we meet refer to as ‘SHOCKING’ weather is that the Prom is mostly deserted: we sense the wild rugged charm that the tourist websites are all raving about, haha. Sandy Point. Heading back up to Fish Creek in the late afternoon, we drive out to explore the shallow inlet of Sandy Point, a lovely summerhouse area, where we stop at a small combined art gallery and home owned and inhabited by a sweet, chatty couple, who bought the place on their honeymoon 51 years ago: she paints gorgeous landscape paintings and he looks after their lush garden, which, besides various flower beds, shrubs and pumpkin patches, houses a granny flat that he rents out on Airbnb. There’s always a few koalas sitting in the tree just above the cabin, he says; just not right now – it must be out on an adventure. Sunday Night at the Pub. With all the vineyards in the area closed due to the dreary weather, we wrap up the weekend at the Fish Creek Hotel – with the allegedly best Pinot Noir in the country, from neighbouring Bass Phillip, and an early dinner consisting of locally and freshly caught baby snapper (me) and steak from an unstressed grass-fed cow (Sanoop). Such a pleasant evening amongst locals… sipping our wine, which really is good, reading our magazines, chatting, laughing, digesting the wonderful week, which has been productive work-wise and stimulating pleasure-wise, all in a wonderful, harmonious flow. Maybe we travel a lot; I like to think we just are where we are a lot.